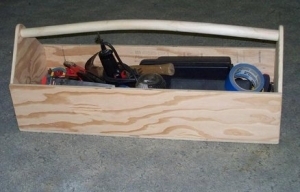 Homemade wooden toolbox utilizing only glue as a fastening agent. Handle is a naturally curved maple branch. This is not only beautiful but classic and one day...an heirloom. Make me one, please.